Ocean Safari offers an exhilarating ride to snorkel the pristine untouched Great Barrier Reef off the Daintree Coast at Cape Tribulation. This half day eco tour visits two different snorkel destinations, each with an extraordinary array of marine life and coral species. After a fast 25 minute ride, guests are ready to swim with turtles and snorkel two fabulous locations at Mackay and Undine Reefs. On most days the rainforest can be seen along the mainland beach whilst snorkelling the Great Barrier Reef, home to an abundance of marine life as well as beautiful hard and soft corals. This half day eco tour visits two snorkel sites including Mackay Reef and Mackay Cay, each with an extraordinary array of marine life and coral species. Often the coastal rainforest of the Daintree can be seen along the mainland beach whilst snorkelling the Great Barrier Reef, two world heritage areas side by side. On most days, you can snorkel alongside sea turtles, which are found in abundance swimming over reefs full of colourful coral, along with myriads of tropical fish, eagle rays, giant clams and starfish. Magical memories like these sometimes only happen once in a lifetime. 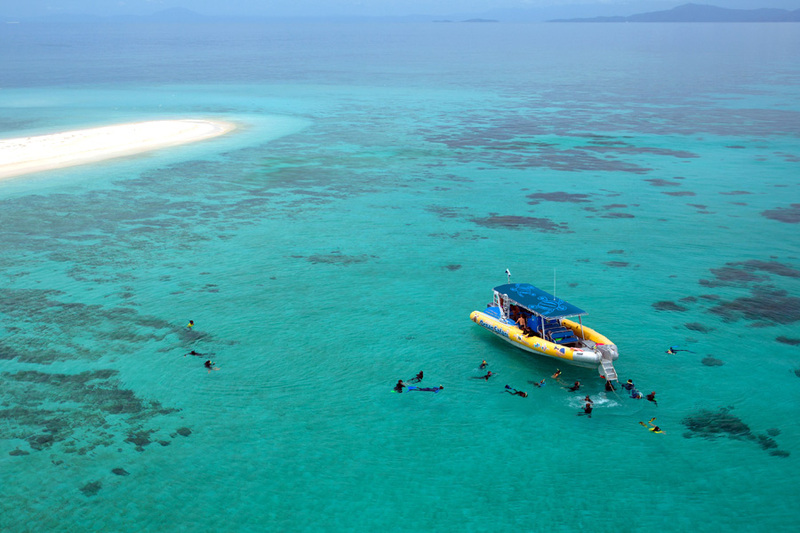 An exhilarating 25 minute ride, Ocean Safari offers the quickest tour to the Great Barrier Reef. A maximum of 25 passengers allows you to experience tropical paradise in the pleasure of a small group. The experienced Skipper and Eco Host offer informative reef interpretations, ensuring your tour is filled with fun and appreciation of the Great Barrier Reef and the coastal rainforest of the Daintree. Ocean Safari takes you from the world heritage rainforest lined beach at Cape Tribulation to Mackay Cay to explore two different snorkelling sites. Relax on the beach or snorkel from the cay to experience the magic of the pristine underwater environment. *please note this timetable is a guide only and pick up times are subject to change. Water, soft drinks, chocolates and cameras for sale on board. All fares are inclusive of Marine Park fees and GST. Sites are weather and tide permitting. Ocean Safari reserves the right to arrange alternative itinerary when necessary. All client cancellations forfeit 25% of total ticket price and all client cancellations made less than 21 days prior to departure will result in complete forfeiture of the full price of the tour or package. If the tour operator has to cancel the trip or activity (prior to the departure) and we cannot offer a suitable alternative, then a refund will be given minus card fees. We strongly recommend that you have travel insurance, especially during the wet season. Please be advised that Asthma, Epilepsy, diabetes, any major heart or lung problems and pregnancy will permit them from diving. A dive medical must be obtained from a doctor prior to departure.